After many years of living aboard I have persuaded Neil and Corinne that it’s time a dog’s point of view was heard on the blog. 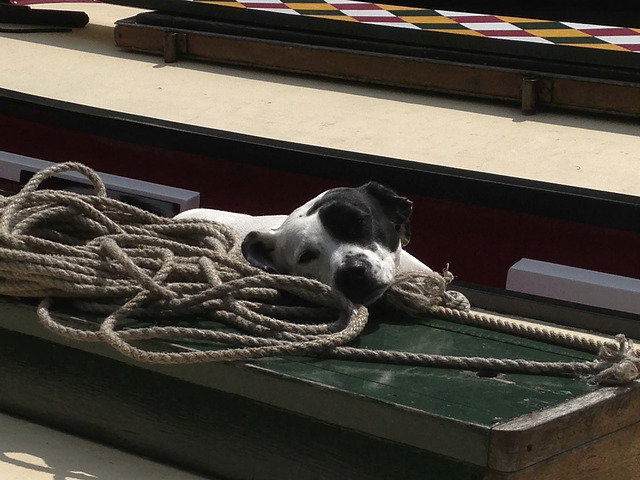 As I’m sure you are aware the idea of a ship’s cat is very outdated and everyone who’s anyone on the canals now has a resident dog. I generally let Neil and Corinne choose our travelling routes providing that my meals and accommodation remain satisfactory. Every now and then we stop at a railway station and I allow a small select group of humans to join me on my next journey. When my guests arrive at the boat they tend to be a little overwhelmed at how charming my boats are; painted deep red and decorated with roses. I make sure Corinne, Neil and the crew give the boats a jolly good cleaning and tidying whilst the new guests drop their bags in to their cabins and perhaps explore locally a little. Later we all like to have afternoon tea, although I myself tend to choose something a little more meaty from the menu, than just tea and cake. Actually at meal times the humans are really quite sociable and seem to rather enjoy themselves. My personal chef, Corinne, of course provides food to a four star standard for everyone on board. Both boats are 70 foot long narrowboats. Snipe has a diesel engine and tows the butty boat Taurus which does not have an engine. Cruising at less than 4mph I love to feel the wind in my hair. I like to sit in either of the fore-decks as we travel, but I also do get a marvellous view of the passing countryside when I sit on the roof. 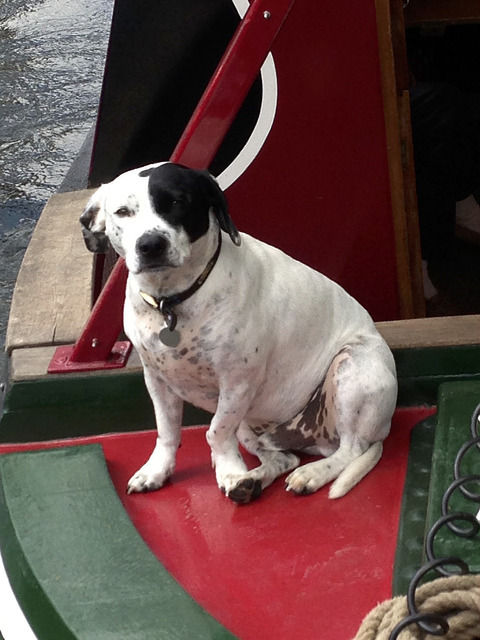 I see plenty of other dogs on the towpath as I cruise by, and they must regard me with the utmost respect when they see a dog with his own pair of traditional narrowboats. When the mood takes me I take a stroll on the towpath and this helps me to check that the crew are operating the locks correctly. 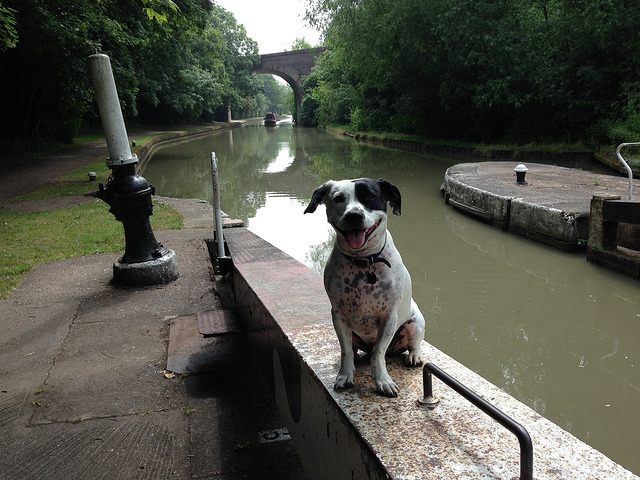 I do love towpath walks, there are lots of exciting things to see and sniff. I just have to look out for the occasional bike coming past. We pass quaint villages, old bridges, sheep and cows. Sometimes we like to visit a cosy pub for a drink and some food. Now and then the guests get off and go for a look round a local town or place of interest, and I get to have the boats to myself for a while. Of course the real benefit for the guests though is getting to spend some quality time with a canal dog like me; the likes of which they have probably never met before. One of our recent guests (also called Corinne) came aboard my boats for her honeymoon. From Corinne’s blog Motherhood Journeys. Don’t paws for thought – just do it! 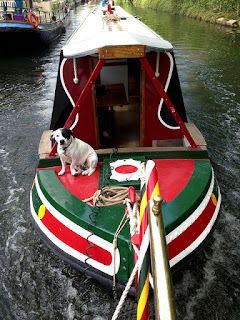 This post first appeared on the Canal Voyagers Hotel Boats blog and is re-published here in loving memory of Bertie P D Thomsett who sadly passed away 25/05/16. *Discount & canal voyages no longer available.